Due to the high lipid content, adipose tissue has been challenging to visualize using traditional histological methods. Adipo-Clear is a tissue clearing technique that allows robust labeling and high-resolution volumetric fluorescent imaging of adipose tissue. Here, we describe the methods for sample preparation, pretreatment, staining, clearing, and mounting for imaging. Chi, J., Crane, A., Wu, Z., Cohen, P. Adipo-Clear: A Tissue Clearing Method for Three-Dimensional Imaging of Adipose Tissue. J. Vis. Exp. (137), e58271, doi:10.3791/58271 (2018). Adipose tissue plays a central role in energy homeostasis and thermoregulation. It is composed of different types of adipocytes, as well as adipocyte precursors, immune cells, fibroblasts, blood vessels, and nerve projections. Although the molecular control of cell type specification and how these cells interact have been increasingly delineated, a more comprehensive understanding of these adipose-resident cells can be achieved by visualizing their distribution and architecture throughout the whole tissue. Existing immunohistochemistry and immunofluorescence approaches to analyze adipose histology rely on thin paraffin-embedded sections. However, thin sections capture only a small portion of tissue; as a result, the conclusions can be biased by what portion of tissue is analyzed. We have therefore developed an adipose tissue clearing technique, Adipo-Clear, to permit comprehensive three-dimensional visualization of molecular and cellular patterns in whole adipose tissues. Adipo-Clear was adapted from iDISCO/iDISCO+, with specific modifications made to completely remove the lipid stored in the tissue while preserving native tissue morphology. 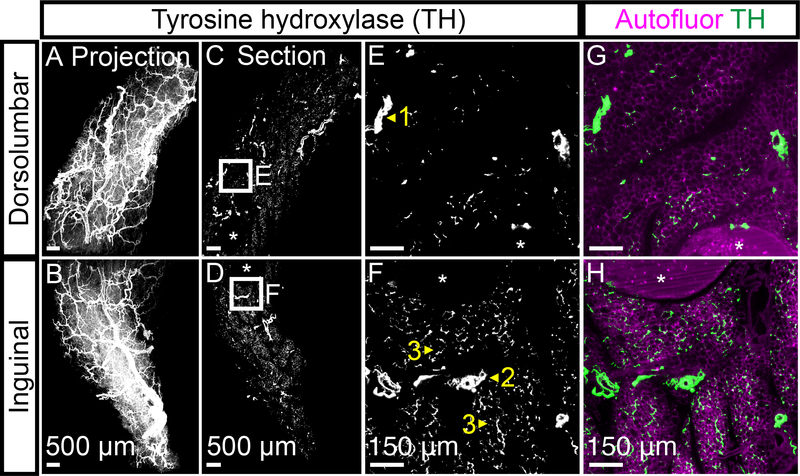 In combination with light-sheet fluorescence microscopy, we demonstrate here the use of the Adipo-Clear method to obtain high-resolution volumetric images of an entire adipose tissue. Until recently, adipose tissue was conceived of as an amorphous collection of fat cells. Over the past few decades, our understanding has grown more sophisticated, with fat now recognized to be a complex organ containing different types of adipocytes, as well as adipocyte precursors, immune cells, fibroblasts, the vasculature, and nerve projections. Interactions among these adipose-resident cells have pronounced effects on adipose tissue and organismal physiology and pathophysiology1. Although emerging studies have unraveled important molecular mechanisms underlying certain interactions, a more comprehensive understanding requires reliable structural profiling of the entire tissue in three dimensions (3D). Our current knowledge of adipose tissue morphology is largely based on histological analysis of thin sections (5 μm) with relatively high-magnification imaging (more than 10X)2,3. However, this approach has several significant limitations. First, intricate filamentous structures such as sympathetic nerves and the vasculature, which are known to play important roles in adipose function4,5,6,7, are difficult to evaluate through thin sections. Second, due to its seemingly amorphous shape and the lack of representative structural units to focus on, it is difficult to appreciate adipose tissue structures based only on section staining. Third, adipose tissue has a very high lipid content, creating challenges in obtaining consistent serial sections that are suitable for 3D anatomical reconstruction, a conventional method used to study whole brain morphology8. Given these factors, there is a great need for a whole-mount approach that can provide 3D visualization of an entire adipose depot while still achieving cellular resolution. 3D volumetric imaging of an entire organ is challenging due to the obscuring effects of light scatter. A major source of light scatter in biological tissues comes from lipid-aqueous interfaces. Although the efforts to eliminate scatter by removing lipids have been ongoing for over a century, there have been a large number of recent innovations9. One such newly developed tissue-clearing method is immunolabeling-enabled 3D imaging of solvent-cleared organs (iDISCO/iDISCO+)10,11. However, adipose tissue presents a particular challenge given its high level of lipids, and therefore, additional modifications to the iDISCO/iDISCO+ protocol are required to fully extract the lipids while protecting the tissue from collapsing. The modified protocol we have developed, now called Adipo-Clear, employs methanol/dichloromethane-based delipidation of adipose tissue to achieve optimal transparency suitable for high-resolution volumetric imaging12. Because the delipidation step largely quenches endogenously expressed fluorescent proteins such as GFP and RFP, visualization of such proteins must be achieved by immunolabeling. Overall, this simple and robust protocol can be applied to study tissue-level organization of adipose-resident cells, lineage tracing of adipocyte progenitor cells, and adipose morphogenesis during development. Animal care and experimentation were performed according to procedures approved by the Institutional Animal Care and Use Committee at the Rockefeller University. Perform standard intracardiac perfusion with ~20 mL of 1x phosphate buffered saline (PBS) at 4 °C until the blood is completely removed from the tissue. Switch the perfusate to ~20 mL of fixative solution (4% paraformaldehyde (PFA) in 1x PBS) at 4 °C until the neck and tail have significantly stiffened. CAUTION: PFA is toxic. Avoid contact with skin, eyes, and mucous membrane. Solutions should be made inside a fume hood. Dissect the fat pads of interest carefully to remove the entire fat pad without damaging it. Use blunt-ended forceps to avoid pinching or squeezing the tissue. Avoid contaminating the dissected tissue with any fur. Post-fix the tissue in 4% PFA in 1x PBS overnight at 4 °C. For each fat pad, post-fix with ~10 mL of fixation solution in a 15 mL conical tube. Wash the tissue 3 times (1 h each) with 1x PBS at room temperature (RT). Store the tissue for short-term (up to 2 weeks) in 1x PBS at 4 °C and protected from light. For long-term storage (e.g., 1-2 years), switch the buffer to 1x PBS with 0.05% sodium azide (as a preservative). CAUTION: Sodium azide is highly toxic when ingested orally or absorbed through the skin. Concentrated sodium azide solutions (at 5% or greater) should be handled under a fume hood. Prepare 20%, 40%, 60%, and 80% methanol gradient with B1n buffer (Table 1) (v/v), e.g., for 20% methanol/B1n buffer, mix 20 mL of methanol and 80 mL of B1n buffer. Store all buffers at 4 °C. Glycine crystals will precipitate from 60% and 80% methanol/B1n buffers due to saturation. Avoid removing the crystals; use the liquid solution for the following washes. CAUTION: Methanol is volatile, irritant, and flammable. Avoid skin or eye contact. Gently remove the hair from the sample under a dissection microscope. Any hair, lint, or debris attached to the sample will cause shadows during imaging. Transfer the cleaned sample into a new tube. Perform all following steps on ice or at 4 °C unless otherwise indicated. For small samples (e.g., posterior subcutaneous/perigonadal fat pads from young lean mice), use 2 mL microcentrifuge tubes with 1.6 mL of the solution. For large samples or samples with high lipid content (e.g., fat pads from obese mice), use 5 mL tubes with 4 mL of the solution. Place the tubes containing the samples horizontally on an orbital shaker set at ~ 100 rpm. Make sure the samples can move freely inside the tube. Dehydrate the sample in a graded series of 20%, 40%, 60%, 80%, and 100% methanol/B1n buffer for the indicated time (Table 2). Minimize the carry-over solution. Delipidate the sample with 100% dichloromethane (DCM) (3 times), each with the incubation time indicated in Table 2. The sample should sink to the bottom of the tube at the end of the second and third DCM washes. If not, extend the incubation time to ensure full delipidation (e.g., extend from 30 min to 1-2 h). CAUTION: DCM should be handled inside a fume hood. Use glass containers for storage and microcentrifuge tubes that are made from polypropylene for incubations. The microcentrifuge tubes should not be used for long-term storage of DCM. Petri dishes and serological pipettes that are made from polystyrene are not compatible with DCM. DCM is highly volatile. Transfer the sample into fresh solution quickly to prevent desiccation. Wash twice with 100% methanol for the indicated time (Table 2). Optional: If the sample is not well-perfused, the color of hemoglobin from the remaining red blood cells might cause strong autofluorescence. Bleach with 5% H2O2 in methanol (1 volume of 30% H2O2 to 5 volumes of methanol) overnight at 4 °C. Rehydrate the sample in a reversed methanol/B1n buffer series: 80%, 60%, 40%, 20% methanol/B1n, and 100% B1n buffer (2 times) for the indicated time (Table 2). Wash the sample with PTxwH buffer (Table 1) for 2 h at RT. Store the delipidated sample in PTxwH buffer at 4° C (up to 1 year) or proceed immediately to the immunostaining step. Note: All of the following steps should be carried out at RT unless noted otherwise, with shaking and protection from light. For small samples, use 2 mL microcentrifuge tubes with 1.6 mL of solution. For large samples, use 5 mL tubes with 4 mL of solution. It is recommended to first validate the antibodies on small pieces of the tissue or methanol-treated tissue sections. Dilute the primary antibody in PTxwH buffer to the recommended concentration. Centrifuge the diluted antibody solution at ~20,000 x g for 10 min to prevent introducing antibody precipitates or aggregations. Incubate the delipidated sample with the primary antibody solution for the indicated time (Table 2). Wash the sample with PTxwH buffer in a series of incubation steps: 5 min, 10 min, 15 min, 20 min, 1 h, 2 h, 4 h, and overnight. Dilute the secondary antibody in PTxwH buffer to the recommended concentration. Centrifuge the diluted antibody solution at ~20,000 x g for 10 min to prevent introducing antibody precipitates or aggregations. Note: To avoid high background caused by tissue autofluorescence, secondary antibodies conjugated with fluorophores that emit light in the red and far-red regions are recommended. Depending on the number of laser lines available on a microscope, up to 3-4 markers can be imaged simultaneously in one sample. Incubate the sample with the secondary antibody solution for the indicated time (Table 2). Wash sample with PTxwH buffer in a series of incubation steps: 5 min, 10 min, 15 min, 20 min, 1 h, 2 h, 4 h, and overnight. Optional: For tissue types that are fragile, fix the stained tissue with 4% PFA in 1x PBS overnight at 4 °C to help preserve tissue morphology. Note: This step may increase imaging background. It is not necessary to perform this step for adipose tissue. Wash the sample with 1x PBS in a series of incubation steps: 5 min, 10 min, and 30 min. Gently remove lint from the sample under a dissection microscope. Optional: Embed the sample in agarose to facilitate sample mounting for light-sheet microscopy. Note: This step is strongly recommended for adipose tissue to stabilize its shape during imaging. Prepare the embedding solution with 1% agarose in 1x PBS (w/v). Cool the embedding solution to ~ 40 °C to avoid exposing the sample to excessive heat. Place the cleaned sample into a mold (e.g., Petri dish or weighing boat) and arrange it into the desired position. Avoid any liquid carryover. Gently pour the embedding solution over the sample. Avoid any air bubbles. Let the agarose fully solidify at RT. Cut out a block containing the sample. Note: All of the following steps including overnight incubations should be carried out at RT, with shaking and protection from light. For small samples, use 2 mL microcentrifuge tubes with 1.6 mL of solution. For large samples, use 5 mL tubes with 4 mL of solution. Dehydrate the sample in methanol gradient with H2O: 25%, 50%, 75%, and 100% (3 times) for the indicated time (Table 2). Note: Sample can be left overnight at the 100% methanol step. Incubate the sample in 100% DCM for 1 h with shaking (3 times). Sample should sink to the bottom of the tube at the end of each DCM wash. If not, extend the incubation time to ensure full removal of methanol. Sample can be left overnight at the 100% DCM step. Incubate the sample in dibenzyl ether (DBE) overnight with mild shaking to achieve refractive index matching. Note: Sample will eventually become transparent in visible light. CAUTION: DBE is hazardous. Avoid any contact with skin. Handle it inside a fume hood with double-layered gloves. Discard the gloves as soon as it is contaminated with DBE. Use glass containers for storage and microcentrifuge tubes (polypropylene) for incubations. The microcentrifuge tubes should not be used for long-term storage of DBE. Petri dishes and serological pipettes that are made from polystyrene are not compatible with DBE. Clean any spill with 100% ethanol. Incubate the sample with fresh DBE with mild shaking for 2 h. Store the sample at RT in the dark or proceed directly to imaging. Note: Samples are recommended to be imaged within a month. Although certain fluorophores are more stable than others, long-term storage of the samples at this stage is not recommended. Imaging with a light-sheet microscope that is compatible with DBE. Note: Only objectives that are approved for organic solvent-based imaging and matched with the refractive index of DBE can be used as dipping objectives in DBE-immersed imaging. Mount the agarose-embedded sample onto a holder that can prevent movement during imaging. Immerse the sample into a DBE-filled chamber. Collect a z-stack covering the whole sample (e.g., 1-2X magnification) to obtain whole-tissue distribution/structure of the marker of interest. Switch to an objective with higher magnification (e.g., 4-12X magnification) to zoom in on the regions of interest to image detailed structures. Note: Collagen is a major contributor to the extracellular matrix of adipose tissue, which surrounds all fat cells13. Collagen has a typical emission spectrum ranging around 400 nm to 550 nm14. Imaging the sample with the 488 laser line (green) and collecting the emitted light at a wavelength range that lies within the emission spectrum of collagen (e.g., 525-550 nm) will provide the tissue autofluorescence signal, which was previously shown to delineate fat cell contour and overall tissue architecture12. Imaging with an inverted confocal or a two-photon microscope. Place the agarose-embedded sample into a chamber slide with a glass bottom without touching any plastic parts (or other DBE-compatible imaging chamber that can seal). Make sure DBE does not leak out. Choose the objectives with longer working distances to achieve deeper penetration. Note: Imaging should be done with an inverted confocal or two-photon microscope through the glass bottom of the chamber slide. Avoid direct contact between the sample and dipping objectives that are not suggested for DBE-based imaging. Adipo-Clear prepared whole fat pads can be imaged in 3D to analyze how tissue morphology and cellular interactions are affected in the lean and obese states. This method can be easily applied to analyze general adipose structure by collecting the tissue autofluorescence signal in the green channel. We have previously shown that the autofluorescence signal in adipose overlays favorably with perilipin staining, a commonly used marker to outline mature adipocytes12. For example, scanning a posterior subcutaneous fat pad (psWAT) using a light-sheet microscope with low magnification (1.3X) shows the lobular organization of adipocytes (Figure 1A and B). More detailed information, such as the size of adipocytes, can be revealed by zooming into the regions of interest with higher magnification (4X) (Figure 1C and D). Adipo-Clear is particularly useful for visualizing filamentous structures such as nerve projections and blood vessels, which are challenging to capture or trace on thin sections. The sympathetic nervous system (SNS) plays a crucial role in controlling lipolysis and thermogenesis in adipose tissue4,5. 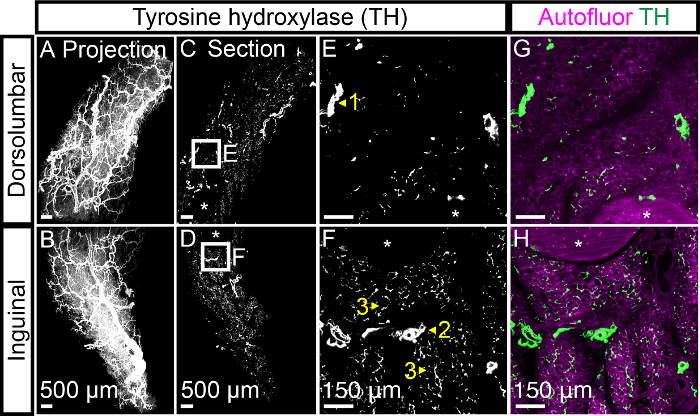 Imaging a psWAT pad stained with tyrosine hydroxylase (TH), a marker for SNS, reveals the structures that appear as large nerve bundles, blood vessel innervation, as well as dense terminal arborization in the tissue parenchyma (Figure 2A-H). In addition, the TH+ parenchymal projections show regional variation within psWAT, with the inguinal portion having higher density relative to the dorsolumbar portion (Figure 2E-H; Supplementary Movie 1). Our previous work has demonstrated that SNS terminal arborization can be computationally traced and reconstructed using the FilamentTracer tool of Imaris software to assess the density of innervation12. Adipose tissue is known to be heavily vascularized. The changes in metabolic demands of adipose are often associated with dynamic remodeling of its vasculature6,7. Robust and rapid profiling of whole-tissue vasculature can provide additional unbiased analysis for blood vessel remodeling. Using platelet endothelial cell adhesion molecule (PECAM-1, also known as CD31) as a marker to label blood vessels, we observed that all adipocytes are in contact with the capillaries throughout the whole tissue (Figure 3A-H; Supplementary Movie 2), supporting the high demand for efficient nutrient and oxygen exchange in adipose. Immune cells are another crucial component of adipose tissue. In the obese state, adipose tissue becomes inflamed, which is accompanied by the infiltration of pro-inflammatory macrophages that form "crown-like" structures surrounding dead adipocytes15,16. Fat pads from obese animals are particularly difficult to clear due to their large size and higher lipid content. However, the extended version of Adipo-Clear (described in Table 2 for large tissue or tissue with high fat content) can achieve consistent clearing of whole high-fat-laden tissue. For example, epididymal fat from a mouse fed with 16 weeks of high-fat diet shows dense "crown-like structures", immunolabeled by CD68, throughout the whole tissue (Figure 4A and B). Importantly, optical sections taken from various positions over the entire depth of the tissue (~4-5 mm) show equally sharp images, demonstrating complete clearing of the tissue (Figure 4C-F). Figure 1: Analysis of adipose tissue morphology using the autofluorescence signal. All panels are light sheet fluorescence microscopy (LSFM) images of an Adipo-Clear prepared psWAT pad isolated from an 8-week-old C57Bl/6J male mouse housed at RT. The autofluorescence signal is collected by scanning the cleared sample with the green channel. Optical sections (cross-sections from the middle of the sample) of the dorsolumbar region (A) and the inguinal region (B) taken by 1.3X objective. (C, D) High-magnification (4X) optical sections of the boxed regions from A and B. Lymph nodes are indicated by asterisks. Scale bars are indicated in each panel. Please click here to view a larger version of this figure. Figure 2: 3D imaging of sympathetic innervation in adipose tissue. All panels are LSFM images of a psWAT labeled with tyrosine hydroxylase (TH) (the same sample as in Figure 1). Maximum projections of the reconstructed dorsolumbar region (A) and inguinal region (B) taken by the 1.3X objective. (C, D) Optical sections from the middle of A and B. (E, F) High-magnification (4X) optical sections of the boxed regions from C and D. (G, H) High-magnification optical sections of the overlay between TH (green) and autofluorescence (magenta). Arrowheads indicate distinct patterns of sympathetic innervation: (1) nerve bundle; (2) blood vessel innervation; (3) parenchymal arborization. Lymph nodes are indicated by asterisks. Scale bars are indicated in each panel. Please click here to view a larger version of this figure. Figure 3: 3D imaging of blood vessels in adipose tissue. All panels are LSFM images of a CD31 labeled psWAT (the same sample as in Figure 1). (A, B) Maximum projections of the reconstructed dorsolumbar region (A) and inguinal region (B) taken by the 1.3X objective. (C, D) Optical sections from the middle of A and B. 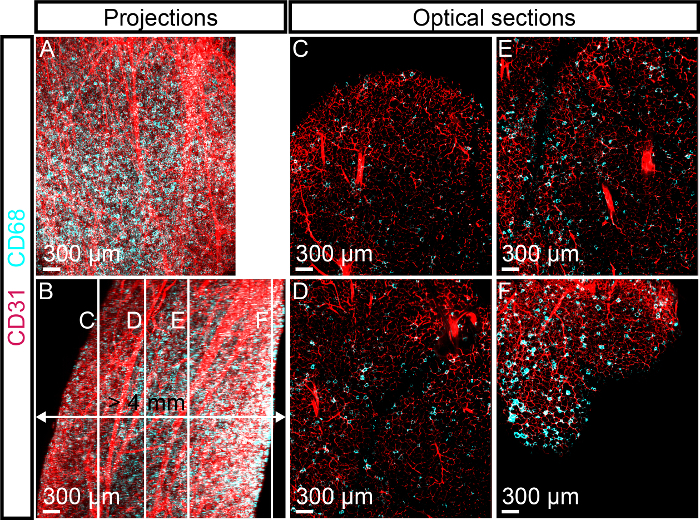 (E, F) High-magnification (4X) optical sections of the boxed regions from C and D. (G, H) High-magnification optical sections of the overlay between CD31 (red) and autofluorescence (cyan). Lymph nodes are indicated by asterisks. Scale bars are indicated in each panel. Please click here to view a larger version of this figure. Figure 4: 3D imaging of the "crown-like structures" in adipose tissue. All panels are LSFM images of an Adipo-Clear prepared eWAT pad isolated from a male mouse fed with high fat diet for 16 weeks. The sample was immunolabeled with CD31 and CD68. (A, B) Maximum projections of the reconstructed sample with a total depth of more than 4 mm. (A) X-Y view. (B) Y-Z view. (C-F) Optical sections from the indicated depths in B. Scale bars are indicated in each panel. Please click here to view a larger version of this figure. Table 1: List of buffers and solutions. This table contains recipes for the buffers used in Adipo-Clear. For long-term storage of the buffers, it is recommended to add sodium azide as a preservative. Table 2: Incubation times for delipidation and immunostaining. This table contains incubation times for the delipidation and immunostaining steps of the protocol. The approximate weight of small tissue is < 300 mg. 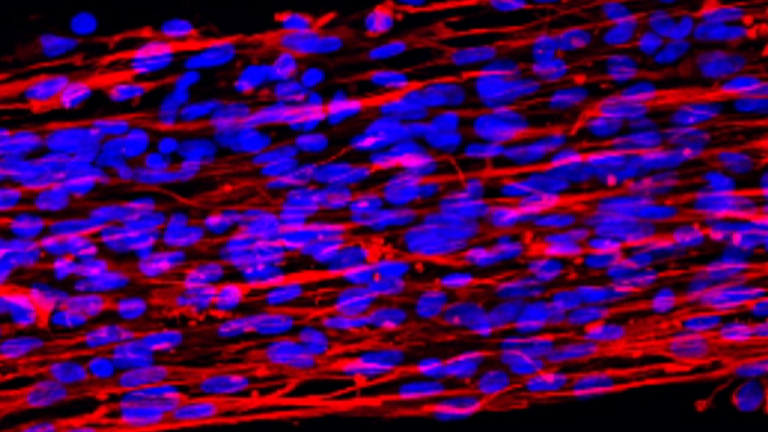 Supplementary Movie 1: 3D imaging of sympathetic innervation in adipose tissue. Tyrosine hydroxylase (TH) immunostaining of a psWAT sample (same as in Figure 2). 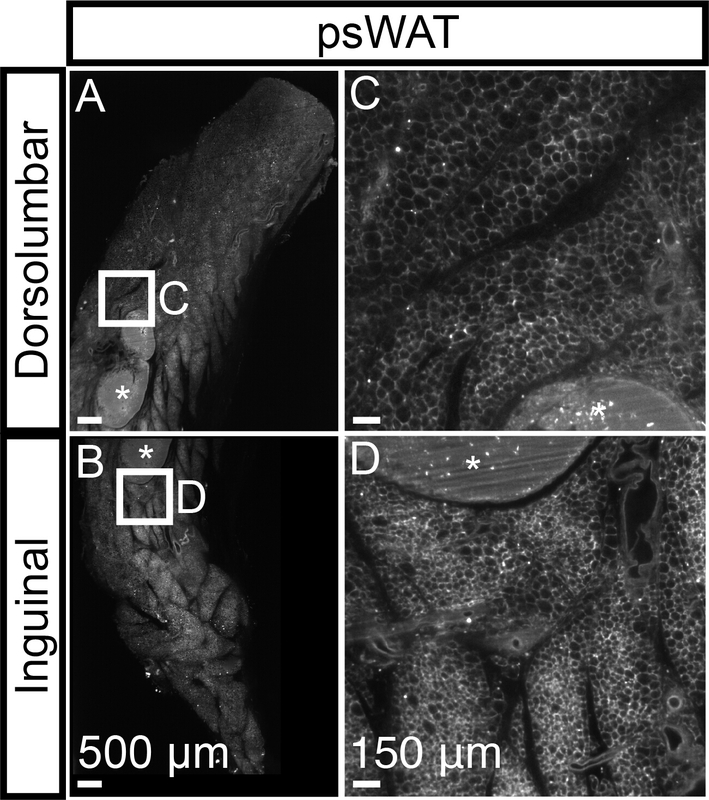 The movie shows the fly-through of optical sections (4X) from the dorsolumbar and inguinal regions of psWAT, with a total depth of ~2 mm. TH is shown in green. Autofluorescence is shown in magenta. The region from the dorsolumbar portion appears to have lower SNS density. Please click here to download this file. Supplementary Movie 2: 3D imaging of the vasculature in adipose tissue. CD31 immunostaining of a psWAT sample (same as in Figure 3). The movie shows the fly-through of optical sections (4X) from the dorsolumbar and inguinal regions of psWAT, with a total depth of ~2 mm. CD31 is shown in red. Autofluorescence is shown in cyan. All adipocytes appear to be closely surrounded by capillaries. Please click here to download this file. Adipo-Clear is a straightforward and robust method for clearing adipose tissue, which can be easily performed in a regular lab setup. In comparison to other solvent-based clearing methods such as iDISCO/iDISCO+10,11,12, Adipo-Clear is particularly optimized for clearing adipose tissue and other tissue with high fat content. The delipidation step completely removes lipids from adipose, and therefore facilitates immunolabeling throughout the whole tissue and largely minimizes light scatter, allowing end-to-end imaging without any loss of XY resolution. In addition to light-sheet fluorescence microscopes, which provide rapid scanning of large tissue, confocal and two-photon microscopes can also be used to obtain greater resolution and more details. The methanol/DCM-based delipidation is a critical step. Insufficient delipidation can result in blurred images, especially towards the core of the tissue. It is important to ensure full removal of lipids by observing adipose samples sinking in DCM. The samples that contain a mixture of tissue types (e.g., epididymal fat with epididymis and testis attached) may not fully sink even with extended DCM incubations. However, incubating these samples overnight in DCM should achieve complete delipidation. Due to the denaturation of proteins in these organic solvents, certain antibodies may not be compatible with the delipidation step. Therefore, choosing a suitable antibody becomes another critical step for this protocol. It is recommended to first validate the antibodies on methanol-treated tissue sections or small pieces of tissue processed by Adipo-Clear. Similarly, the compatibility of chemical dyes with methanol/DCM/DBE should also be tested before application. One limitation of the protocol is the quenching of the endogenously expressed fluorescent proteins. The organic solvent-based delipidation and clearing steps largely denature such proteins. To visualize endogenous fluorescent proteins, antibody labeling needs be employed. The availability of suitable antibody combinations limits the ability to perform highly multiplexed imaging. The current available light-sheet microscopes only allow us to image up to 4 channels. Adipo-Clear is particularly useful for visualizing filamentous structures and cell populations that have relatively low density in adipose tissue. However, imaging dense signals becomes limited with this approach. When antibodies are used to label dense signals, they can be sequestered by the epitopes located on the surface of the sample, blocking the access to the tissue interior. Therefore, small chemical probes are recommended to stain dense structures. Due to the same issue, the application of Adipo-Clear to brown adipose tissue is limited. Brown fat is an adipose depot with dense structures. In addition to dense blood vessels and nerve innervation, it is also tightly packed with small adipocytes that contain a large number of mitochondria17. When applying CD31 and TH staining with the same procedure as described above to brown fat, only the surface of the sample was labeled (data not shown). Moreover, brown fat produces strong tissue autofluoresence, leading to low signal-to-noise ratio during imaging. It is recommended to cut brown fat into smaller pieces and use chemical probes when possible. Overall, Adipo-Clear allows simultaneous profiling of multiple structures of interest with high-resolution in whole adipose tissue. Using this approach, one can analyze how structures such as nerve projections, the vasculature, immune cells, and adipocytes interact throughout the whole fat pad. It provides unbiased imaging data by avoiding sectioning or choosing regions of interest. Adipo-Clear can also be applied to study adipose development such as events during early morphogenesis as well as the distribution of adipocyte progenitor and precursor cells in lineage tracing studies. In addition to adipose, Adipo-Clear may also facilitate 3D whole-mount analysis of other tissues that have high lipid content or are surrounded by fat, such as mammary gland and fatty lymph node. This method also offers an opportunity to study the histology of human adipose tissue in physiological and pathological conditions. We thank Christina Pyrgaki, Tao Tong, and Alison North from the Bioimaging Resource Center at the Rockefeller University for assistance and support. We also thank Xiphias Ge Zhu for movie editing. This work was supported by the Human Frontier Science Program Organization (PC). Rosen, E. D., Spiegelman, B. M. What We Talk About When We Talk About Fat. Cell. 156, (1-2), 20-44 (2014). Barbatelli, G., et al. The emergence of cold-induced brown adipocytes in mouse white fat depots is determined predominantly by white to brown adipocyte transdifferentiation. American Journal of Physiology - Endocrinology and Metabolism. 298, (6), E1244-E1253 (2010). Wang, Q. A., Tao, C., Gupta, R. K., Scherer, P. E. Tracking adipogenesis during white adipose tissue development, expansion and regeneration. Nature Medicine. 19, (10), 1338-1344 (2013). Bartness, T. J., Liu, Y., Shrestha, Y. B., Ryu, V. Neural innervation of white adipose tissue and the control of lipolysis. Frontiers in Neuroendocrinology. 35, (4), 473-493 (2014). Morrison, S. F., Madden, C. J., Tupone, D. Central Neural Regulation of Brown Adipose Tissue Thermogenesis and Energy Expenditure. Cell Metabolism. 19, (5), 741-756 (2014). Xue, Y., et al. Hypoxia-Independent Angiogenesis in Adipose Tissues during Cold Acclimation. Cell Metabolism. 9, (1), 99-109 (2009). Shimizu, I., et al. Vascular rarefaction mediates whitening of brown fat in obesity. The Journal of Clinical Investigation. 124, (5), 2099-2112 (2014). Abe, H., et al. 3D reconstruction of brain section images for creating axonal projection maps in marmosets. Journal of Neuroscience Methods. 286, 102-113 (2017). Richardson, D. S., Lichtman, J. W. Clarifying Tissue Clearing. Cell. 162, (2), 246-257 (2015). Renier, N., et al. Mapping of Brain Activity by Automated Volume Analysis of Immediate Early Genes. Cell. 165, (7), 1789-1802 (2016). Chi, J., et al. 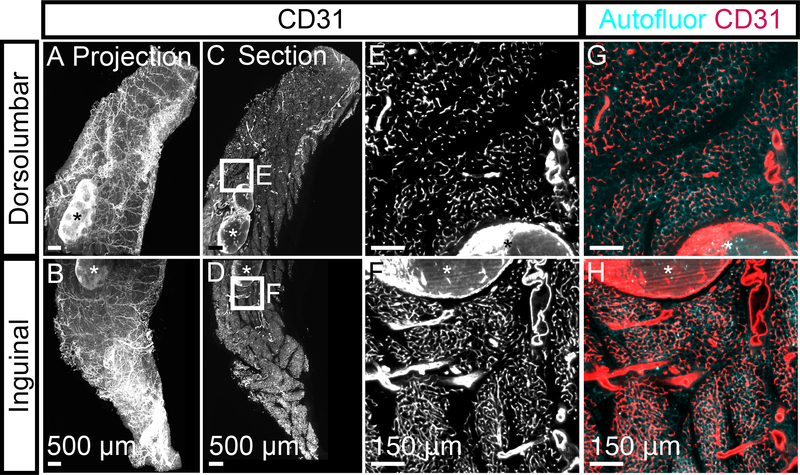 Three-Dimensional Adipose Tissue Imaging Reveals Regional Variation in Beige Fat Biogenesis and PRDM16-Dependent Sympathetic Neurite Density. Cell Metabolism. 27, (1), 226-236 (2018). Khan, T., et al. Metabolic Dysregulation and Adipose Tissue Fibrosis: Role of Collagen VI. Molecular and Cellular Biology. 29, (6), 1575-1591 (2009). Croce, A. C., Bottiroli, G. Autofluorescence Spectroscopy and Imaging: A Tool for Biomedical Research and Diagnosis. European Journal of Histochemistry EJH. 58, (4), (2014). Oh, D. Y., Morinaga, H., Talukdar, S., Bae, E. J., Olefsky, J. M. Increased Macrophage Migration Into Adipose Tissue in Obese Mice. Diabetes. 61, (2), 346-354 (2012). Cinti, S., et al. Adipocyte death defines macrophage localization and function in adipose tissue of obese mice and humans. Journal of Lipid Research. 46, (11), 2347-2355 (2005). Wang, W., Seale, P. Control of brown and beige fat development. Nature Reviews Molecular Cell Biology. 17, (11), 691-702 (2016).